I remember when these launched two or three years ago, I was desperate to get my hands on at least one shade. I wasn't the promise of scented nails that got me, it was the packaging. It's just so gorgeous and I still keep these on my glass shelves next to my vanity. Back then was obsessed with finding the perfect deep red/vampy shade, so I grabbed Bordeaux, a deep wine colour, which did not impress me at all with the scent. However, I was told the rest of the shades are better, Ginger Melon in particular, which was on my wishlist ever since I first saw these, but high price and the fact it looked similar to Essie's Cute as a Button, held me back from ever purchasing it. That is until these were 50 % off, when I finally snatched a bottle. 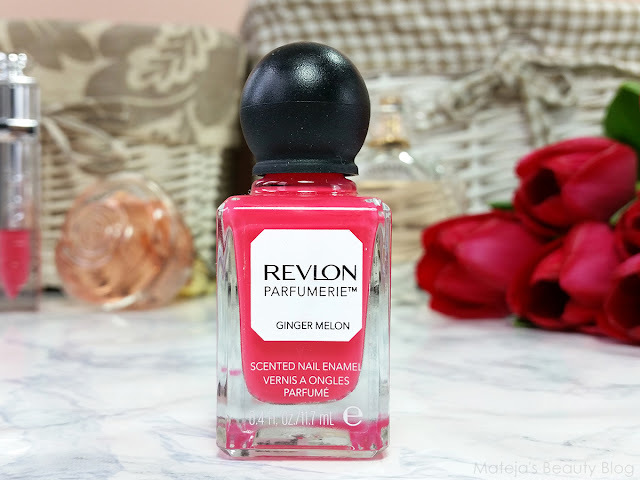 Ginger Melon is a bright coral-pink shade, a proper summery shade that has enough pink in it that it doesn't look orange against my skin tone. Truly a very beautiful colour. I expected it's a dupe for Essie's Cute as a Button, but Ginger Melon is pinker and has less coral hues.